With the holidays now upon us, people are always looking for new, tasty and simple appetizer recipes to serve at parties and gatherings. 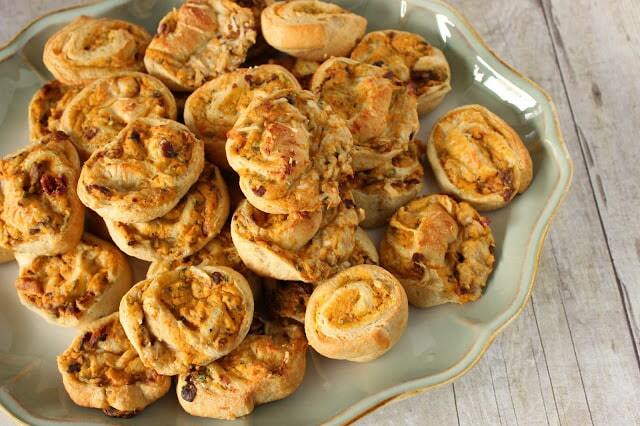 I came up with this simple Savory Pumpkin Sage Pinwheel Appetizers when my sister asked me to bring an appetizer to Thanksgiving this year. In keeping with the theme of the season, I thought pumpkin and sage would be a lovely combination all wrapped up in some store bought crescent dough. 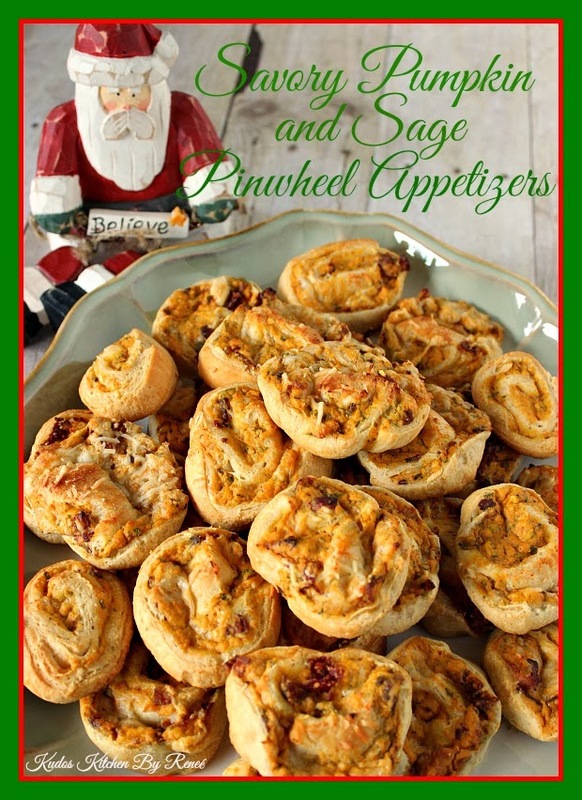 Add to that some bacon and cream cheese and you have a pinwheel appetizer that is sure to wow any holiday crowd! I hope you’ll agree. -In a large bowl, blend the cream cheese, pumpkin, bacon, sage, salt, pepper and garlic powder. -Unroll the one of the crescent doughs and form in into a decent rectangle. *Note – If using perforated crescent rolls, make sure to pinch together all the seams. -Spoon half of the pumpkin filling onto the dough and spread it out to within 1″ of the edges. -Sprinkle half of the Parmesan cheese over the pumpkin filling. -Carefully roll the dough lengthwise into a long log. 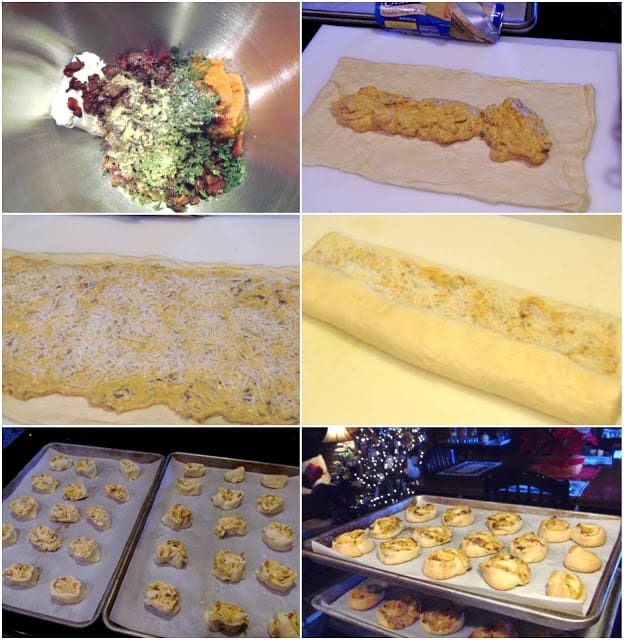 -Place the roll onto a parchment lined baking sheet. Set aside while you prepare the second roll using the same method. -Place the unbaked rolls into the freezer for 15 minutes to firm. -Remove the rolls from the freezer and, using a serrated knife, slice the log into 1/2″ slices. Place the slices onto a parchment lined baking sheet about 2 inches apart. *Note – you made need to re-form them a little with your hands if they squish too much during the slicing process. -Bake for approximately 20-25 minutes or until they’re nicely golden brown. *Note – These travel nicely and don’t need to be pipping hot to be enjoyed! I just know you’re going to love the flavor of these as much as my family did on Thanksgiving. 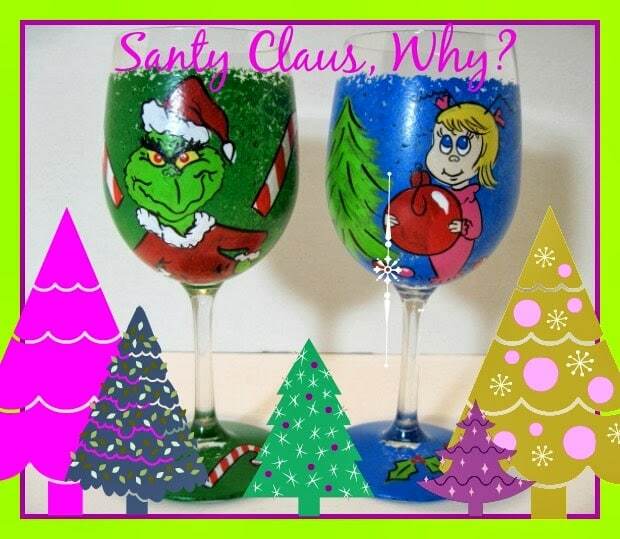 Plus, they’re guaranteed to put a smile on any Grinch’s face this Christmas season, and for that we can all be thankful!! Please contact me or (visit my shop) if there is ever anything I can paint for you! Kudos Kitchen By Reneé ~ Where food and art collide on a regular basis. I think I would have passed on the turkey just to fill up on these. An entire pound of bacon is what caught my eye as much as the pumpkin filling! Can the pumpkin pinwheels be made in advance & frozen for a couple of weeks? I would suggest that you put them together up until to slicing and baking part. Wrap the log and freeze. When you’re ready to serve, I’d partially thaw, slice, and bake. If they’re still a little frozen, the bake time may be a few extra minutes, but other than that, everything should be good. I hope this helps. Enjoy! !